How are you liking the KnB Season 3? Is naruto good?... Also which ones from your list are the more mature ones? Not watched it at all yet. The order I put them in is what I'd rate them tbf. All of them are like bleach in the sense they have really serious moments and some comedic ones. Naruto on it's own is pretty great but most people would agree that after one of the big fights in shippuden, it really started to drag on. I'd also say stick with Bleach at least until episode 25ish as that's when it starts to get going properly. Surprised no one answered "not after I got my Haruhi dakimakura". We have our first 1/10 initial rating of the season: Vampire Holmes. It is really bad to look at and the five minutes were numbing. Great. My mean score for my MAL continues to travel towards sub 5/10. I wouldn't even rate it tbh, possibly worst anime I've seen. 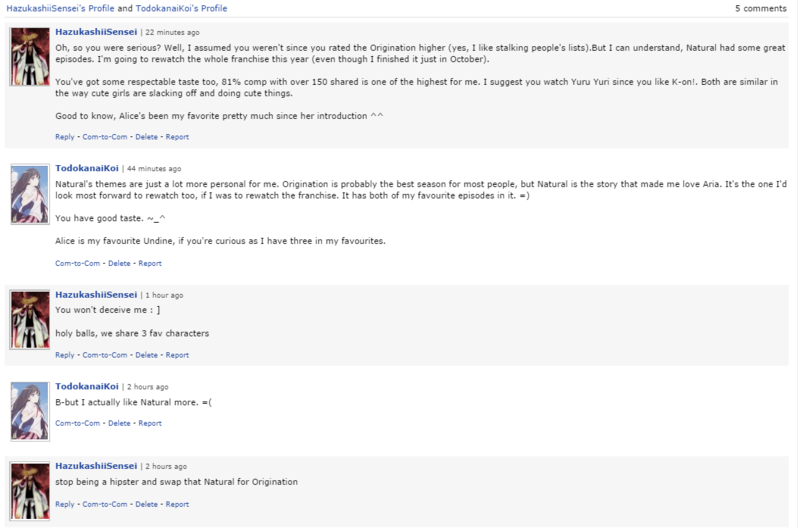 Watch Shitcom, No Littering, or the other assortment of anime I've given a 1/10 on MAL. There's worse. A lot worse. Does this mean I need to watch Aria now? It's one of the best, but I have a nagging doubt over what kind of people will enjoy it. It depends on what you like sort of. I can see 90% of people slagging it off as boring, when it isn't and it is so well-made. What about it would be considered boring? Is it just slowly paced or what? It's their sentence structure and grammar. It is also because I can say this, "Mike, something something" or "Something something, Mike". It just means you might not get the same pattern twice even in English. Also anime is basically ''street language'' and the actual japanese language is pretty hard . Instead of you ''You know'' in anime they say '' ya know'' different pronounced and the structure is also different in Anime they can use words sometimes in anyway they want but if they got really technical with grammar it wouldn't be possible. However, my friend said they all speak street language in japan it's the norm. Slowly paced and slice of life without a real story or drama in general. You mean formal and informal? Listening to formal tone always makes me giggle a little. The airplane workers exclusively use it, so their sentences are really predictable and repetitive structurally. It's kind of endearing. Like there should really be a drinking game for the number of desu, mashita, and masu that are said in an airplane service announcement. As if there needed to be anymore hype. Just to be sure, this is the order right? Yep. Don't try to watch too many episodes in succession. You will fall asleep. 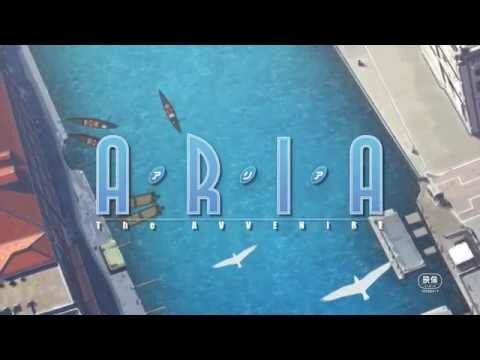 Aria is the only show that makes this happen, well from my experience so far. Animation > Natural + Origination. Animation is actually really dull. I feel bad suggesting a show knowing people can easily be turned off by the first ten episodes. Eleven is the turning point. I can see why people would call it dull but I found the show in general lovely enough to make me want to watch more. If it's better than Vampire Holmes I'll watch it.